SOMS PTA is happy to announce our partnership with The Sports Hut for all your Spirit Wear needs! 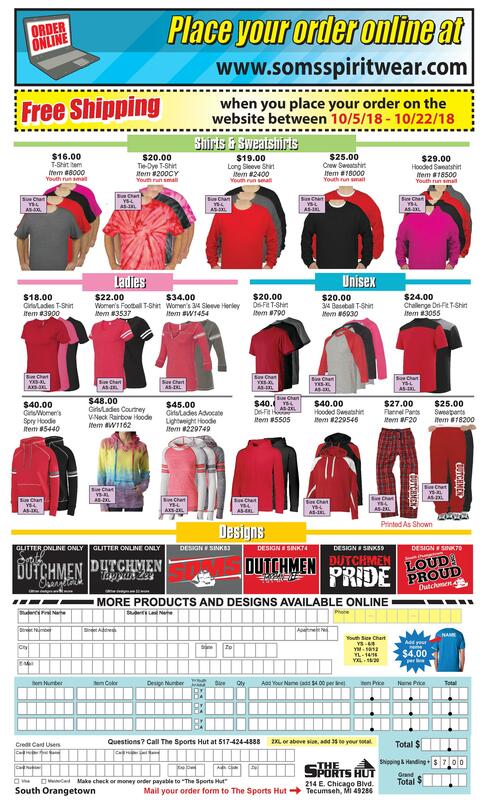 Select from our 12 NEW SOMS or Dutchmen designs, then choose from over 70 different clothing items and products. You can make purchases ALL YEAR LONG and your order is sent DIRECTLY to your home! BONUS! FREE SHIPPING when you place your order online between Oct 5th to Oct 22nd! This is an amazing Spirit Wear Fundraising Opportunity for SOMS! A portion of all spirit wear sales comes back to SOMS PTA, allowing us to continue providing assemblies, activities and events for our students. Thank you for your support!